SCOOTA Video, Mobile advertising network details. 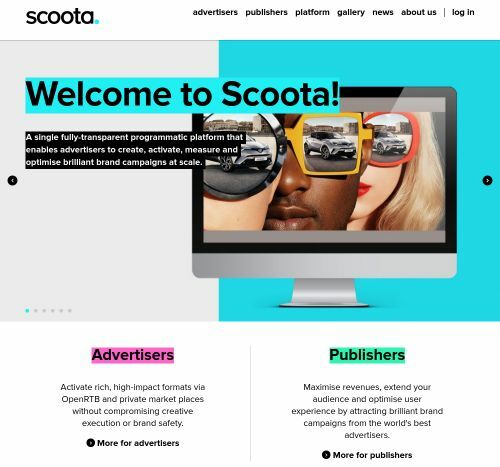 Scoota is an English platform founded in 2008 and specialized in next-generation digital brand activation. They offer a transparent programmatic platform in order to create and deliver rich and enticing formats via multiple marketplaces. Scoota is using an intelligent campaign delivery system called Sentinel, which evaluates and calculates all the possibilities for the environment where it is delivered. This platform also contains optimized bot-detectors and fraud detection engines. With Scoota, you also benefit from a creative toolkit that enables HTML5 and many more, daily summary stats & strategy plans. Once you create an account, you will get connected with an experienced Manager who will do the best to help you. If you have any other questions before signing up with Scoota, please use the contacts above.